Habit: Monoecious. Stem: erect or ascending, 30--100 cm, generally branched, green or purple, glabrous. Leaf: petiole 8--40 mm; blade (10)20--60(100) mm, 1--5(10) mm wide, linear to narrow-lanceolate, base narrowly wedge-shaped, tip acute, margins flat. Inflorescence: axillary and terminal, spike-like, +- flexible to nodding, main axis 10--30 cm, 1--2 cm wide (including flowers), green-silver to pink-purple; bracts 1--1.8 mm, < perianth, membranous, ovate to lance-ovate. 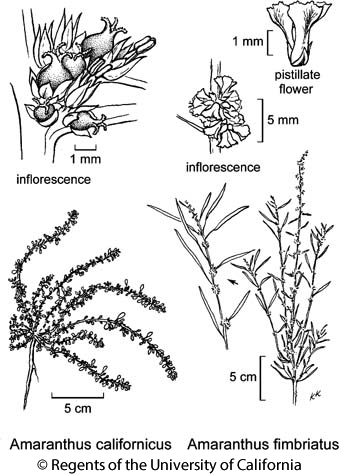 Flower: staminate flower generally at inflorescence tips, perianth parts 5, stamens (2)3; pistillate perianth parts 5, +- equal, 1.5--3.3 mm, reflexed, fan-shaped, tip obtuse, margins finely dentate to minutely toothed; stigmas 3(4) erect to +- spreading. Fruit: circumscissile; 1.3--2 mm, +- spheric to ovoid, green to tan, wrinkled especially near tip. Seed: 0.9--1 mm, lenticular, round, dark red-brown to black, smooth, shiny. Chromosomes: 2n=34. Citation for this treatment: Mihai Costea 2012, Amaranthus fimbriatus, in Jepson Flora Project (eds.) Jepson eFlora, http://ucjeps.berkeley.edu/eflora/eflora_display.php?tid=12919, accessed on April 24, 2019.